What's trending in the realm of Video Production? Wait, CRUX will tell you! Videos have gradually restructured the world of marketing. It's no longer an option brand liked to explore but has become one of the most crucial parts of any marketing plan or content strategy. And with technological innovations happening every second, there seem to be no limits vis-a-vis video production. Being one of the top animated video production companies in India, CRUX put leverage on engraining current trends into each of our projects. 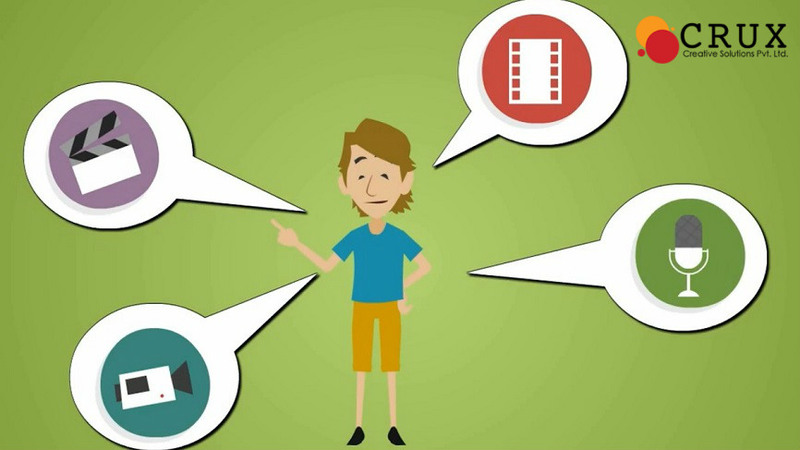 Talk of best animated business video production services in Gurgaon and Delhi NCR and you will find CRUX giving the same of standards that are par excellence. Owing to Facebook and Twitter, there is already a boom of live streaming videos; people have welcomed this trend with the utmost alacrity. The statistics further reveal that viewers have increasingly shifted to watching videos on YouTube than watching TV during the prime time. Now, this has come as a clear cue for companies to proffer more and more video, high-end streaming in particular to earn the maximum audience. CRUX, as a part of our animated video production process, quite efficiently uses this trend to our benefit. We not only encourage our clients to explore this trend but also use it ourselves to the maximum. Premeditated research is a critical part of CRUX's content strategy (Also Read: THE IDEAL CONTENT STRATEGY WHICH MAKES CRUX THE BEST CONTENT MARKETING COMPANY IN INDIA) which makes us research and plan everything in advance. Often, when we strategize video content, we scheme them in series as it leads to better engagement. And as a matter of fact, it is also a significant trend trailed by lots of brands. Series of videos keep the viewers attached to your content for extended periods fetching better results. In terms of cost, experience, and engagement, 360-degree videos have crafted a new realm of video production. They the latest fad and have proved to be a winning maneuver for animated video production. Hence, progressively companies have become experimental enough to bask in such novel technology and so does CRUX, the best animated explainer video production company in Delhi NCR. With YouTube launching their VR page and big players like Google developing such devices, virtual reality has become the next big thing the world of video production. It maximizes the viewing experience to unbound limits. Consequently, brands have started using it extensively as it makes for a very innovative form of marketing. The best animated business video production company in Gurgaon, CRUX has become well-versed with the know-how of 4K videos, the latest trend in video production. These ultra-high definition videos give best picture quality for any video. Soon, companies will trade their conventional production methods for 4k video shootings. CRUX Creative Solutions Pvt Ltd is a comprehensive digital marketing agency with a team of vibrant professionals who love to stay updates and subsequently imbibe those trends into their work to produce a masterpiece.